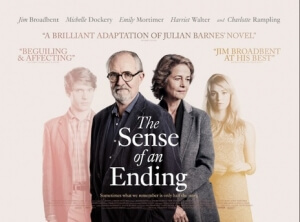 The inevitable film adaptation of author Julian Barnes’ novel The Sense of an Ending, inevitable only because it was the 2011 recipient of the highly-regarded Man Booker Prize (though let’s face it, they would have made a movie out of it regardless of its accolades), comes with a fair amount of anticipation from its many readers, and with a startling indifference from everyone else. I have not read the book, and am thus judging director Ritesh Batra’s film on its own merits, and by that logic the film is perfectly fine. It delivers just what you’d expect from a film like this, with some solid performances and late out-of-nowhere twists, but it’s nothing spectacular to write home about. As I assume it is in the book, we follow old curmudgeon Tony (Jim Broadbent) who lives a virtually hermit-like existence, if it weren’t for the support of his ex-wife Margaret (Harriet Walter) and his love for his heavily-pregnant daughter Susie (Michelle Dockery). Soon, Tony is forced to face the ghosts of his past when he is bequeathed a diary that is currently in the possession of his ex-girlfriend, Veronica (Charlotte Rampling), which in turn triggers flashbacks to Tony’s time as a young university student (Billy Howle), when he commits a damning act of contempt that destroys his relationship with young Veronica (Freya Mavor) and his best friend Adrian (Joe Alwyn, last seen standing out in Ang Lee’s Billy Lynn’s Long Halftime Walk). The film takes a non-linear approach to showing these two timelines opposite each other, and sometimes the editing in between them can feel quite sporadic and sudden except for when it is intended to be so, making things slightly disjointed and fragmented. You could argue that was probably the point, seeing how it’s a film about memory and from the perspective of someone significantly older than they were, but as an audience member I found some of the shaky transitions to often be distracting and prevented me from being fully engrossed into what was going on. One minute, the film asks you to focus on Tony in his old age, and the next it’s showing us an extended segment from his youth, and it could be quite muddling to piece it all together as a result, not to mention sending my attention span on a wild ride. While the film and its story was difficult to get fully invested into, as were the characters and their frustrating sense of self-importance all the way throughout it, it was the performances that helped glue it all together for me. Broadbent gives us his most subdued performance in years, and in doing so allows us to examine this closed-off and vulnerable figure far more intimately than words ever could, turning what is upon close inspection a rather unlikeable figure into someone that you can understand the psychology of. Rampling is in the film far less than the advertising suggests, but in what limited screen time she has she brings the ice-cold nature that brought her such acclaim with films such as 45 Years, and turns it into something a bit more human and not just a one-note ice queen. Of the flashback segments, young actors Howle and Mavor do well, as does Alwyn who, after standing out in the title role in Billy Lynn’s Long Halftime Walk, continues to show he has what it takes to break out in a big way, but just needs to find the right project to do so. Emily Mortimer, in another small but key role as Veronica’s ditzy mother, also leaves enough of an impression in the small amount of time she is given, but it also just reminds you of how underused Mortimer has been in films as of late, and like Alwyn seriously needs a major project of her own to fully shine. Again, having not read the book I can’t comment on how closely it sticks to the source material, but on its own The Sense of an Ending is a fine, if ultimately disposable, British drama that thrives on the magnificent on-screen talent, and gives us a solid character-based drama that doesn’t quite fit together completely, but is decent enough to make a picture you can comprehend. The Sense of an Ending is a wholly decent British character-based drama with some excellent performances, particularly Jim Broadbent who plays his most intimate and vulnerable character in years, and a solid enough story to keep things afloat, though it’s hard to get fully invested in everything with some scattershot editing and a somewhat unfocused narrative that never becomes as great as it wants to be.